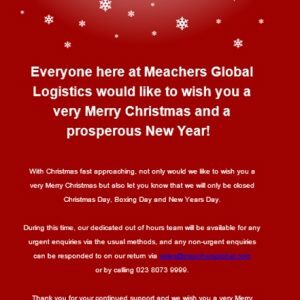 Meachers Global Logistics would like to wish you a very Merry Christmas and a prosperous New Year! Everyone here at Meachers Global Logistics would like to wish you a very Merry Christmas and a prosperous New Year! With Christmas fast approaching, not only would we like to wish you a very Merry Christmas but also let you know that we will only be closed Christmas Day, Boxing Day and New Years Day. or by calling 023 8073 9999. Thank you for your continued support and we wish you a very Merry Christmas and a Happy New Year!